This is not your ordinary cucumber pickles! 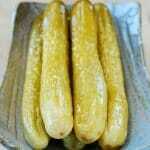 Oiji (오이지), Korean cucumber pickles, is fermented simply in salt water. It is an age-old technique to preserve cucumbers beyond their growing season. No canning and no acidic liquid is used! During fermentation, a deep tangy flavor develops, the color turns golden yellow, and the texture becomes crunchy and slightly chewy. 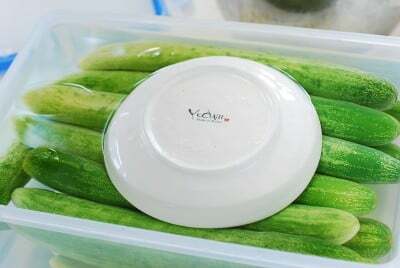 My mother’s generation used to pickle a large earthenware (hangahri, 항아리) full of cucumbers (100 or more) in early summer to consume throughout the summer and until the next growing season. Many households still do. Oiji is a humble but essential food item in Korea. 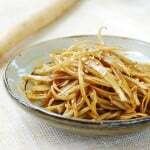 These days, commercially prepared oiji is also available in the deli section of Korean markets. That’s an option if you don’t get to make your own. Korean cucumbers are light in color, slender, and bumpy with thin skin. They are still available in Korean markets around here. 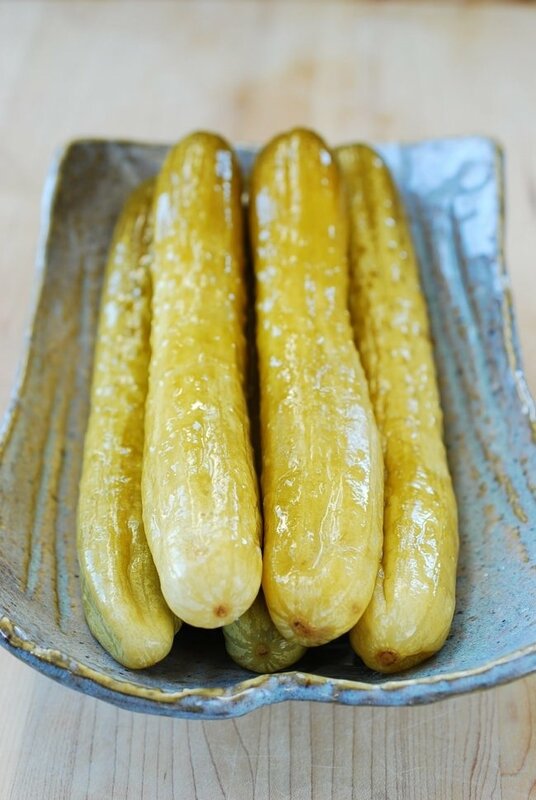 Use kirby pickling cucumbers if you can’t find Korean cucumbers. Look for the freshest ones that are thin and small. The process is quite simple, but the ratio of water to salt is the key. I use the ratio of 10 to 1. 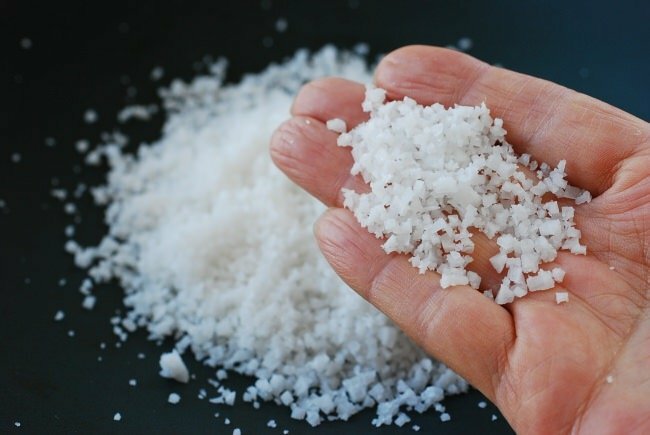 It’s best to use Korean coarse sea salt. The salt water is boiled first and then poured, while still boiling hot, directly over the cucumbers. No, this will not cook the cucumbers. It’s a technique Korean homes traditionally use to keep the cucumbers crisp and crunchy during fermentation. 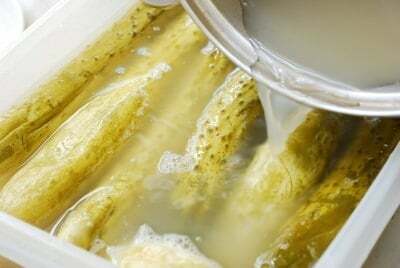 Make sure the cucumbers are entirely submerged in the salt brine at all times, or the exposed part will turn soft. I use a heavy plate or two to weigh them down. 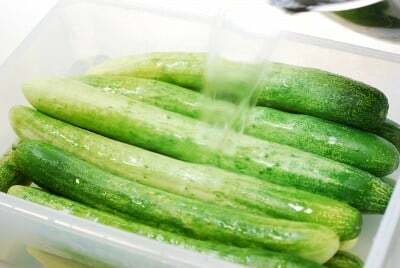 In 2 to 3 days, the cucumbers will have released a lot of water, diluting the salt brine. Pour the brine out into a pot, and boil for a few minutes. Cool it this time, and pour back over the cucumbers. You may see a white film develop on the surface of the water. That’s called golmaji (골마지), which is not harmful. Just remove it with a strainer. 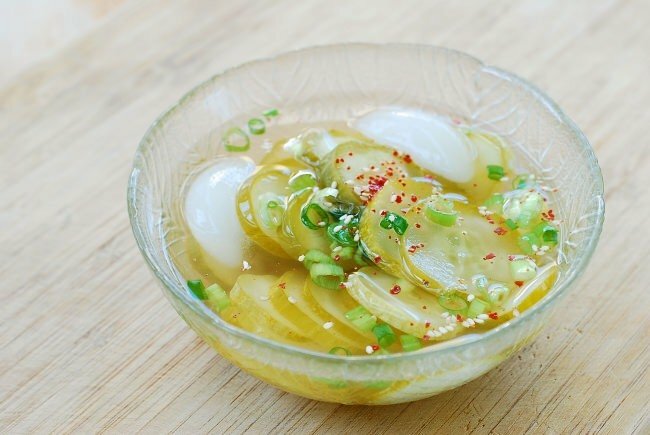 These Korean fermented pickles are not meant to be eaten right out of the jar because they are quite salty. They are soaked in fresh water for the purpose of reducing the salt content before being used. Sometimes, they are served in the water used to soak the pickles to be eaten like water kimchi (e.g., dongchimi). Oiji muchim (오이지 무침) is another common way to serve these cucumbers. 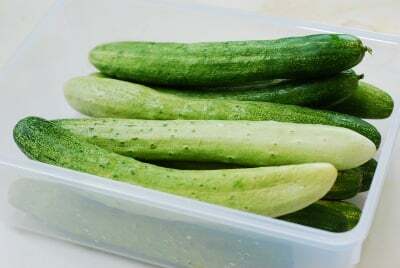 After being soaked, thinly sliced cucumber slices are squeezed tightly to remove the water content, and seasoned with gochugaru and other seasonings. 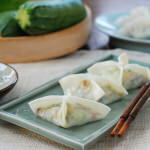 I will post my oiji muchim recipe soon. 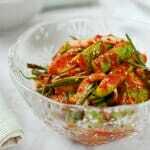 Korean fermented cucumber pickles - crunchy with deep tangy flavor! Rinse the cucumbers, and air dry or pat dry with a paper towel. Bring the water and salt to a boil, and continue to boil for 3 or 4 minutes. Place the cucumbers in a jar or a container (heat proof, BPA free). Pour the boiling water directly over the cucumbers, or you can put the cucumbers in the pot with the boiling water. 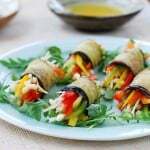 Keep them entirely submerged in the water by weighing them down with a heavy plate or bowl. When the salt water has cooled down, close with the lid, and let stand at room temperature. 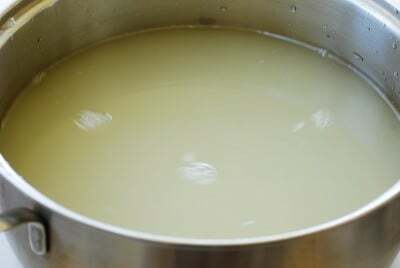 After 2 to 3 days, pour the brine out into a large pot, and boil it for a few minutes. If there’s a while film (golmaji) on the surface of the water, strain it out before boiling. Then, cool completely. Pour the cooled brine back over the cucumbers. Close with the lid, and ferment at room temperature for 5 to 7 days, and then refrigerate. The color of oiji should be between olive green and yellow at this point. They can be eaten, but the flavor will further develop with more time, 2 to 3 weeks to a few weeks. To serve, thinly slice the cucumber and soak in fresh water until the desired salt level is achieved. 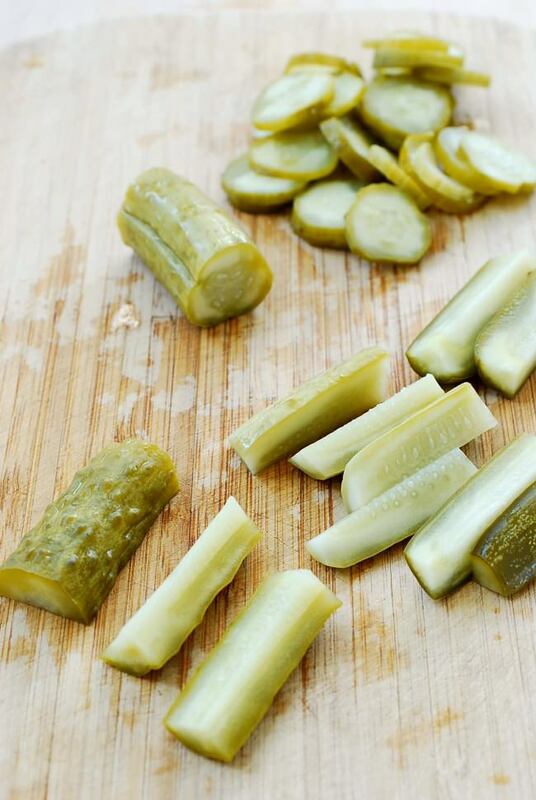 You can also cut the cucumber into about 2-inch logs and quarter each one lengthwise. Sprinkle with some gochugaru and/or sesame seeds and garnish with chopped scallion, if desired. You can also add a little bit of vinegar to taste and drop in a couple of ice cubes. I remember my mom making this cukes. My sister would eat them with rice every meal. I on the other hand liked the other way – muchim. 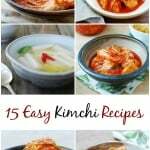 I think I will make some for my sister with this recipe. 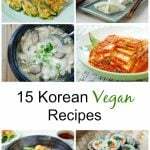 When my mom passed away two years ago (I miss you so much everyday) I wondered how I would cook Korean food. Now with Internet so many things are possible. 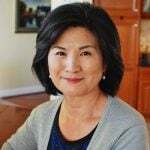 Thank you so much for your recipes. Hello. I made Oiji (Korean Pickled Cucumbers) a few days ago and was very pleased with the result. I followed every step to the letter, however I used Persian Cucumbers and Maldon Sea Salt Flakes. The results were outstanding and everyone in the family loved the cucumbers. Today I made another batch in my one gallon jar. Great recipe and THANK YOU.